What if…You Put it Down, Flipped it and Reversed It? 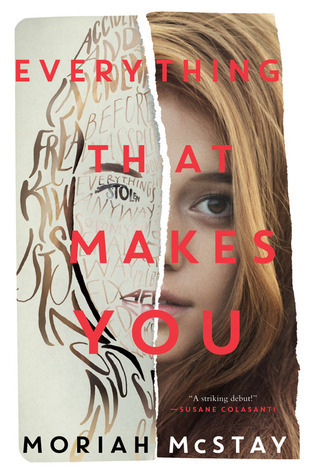 Everything That Makes You by Moriah McStay. March 17, 2015. Katherine Tegan Books. hb $17.99. 329pp. 9780062295484. Grades 7 and Up. …that’s all I kept hearing while reading this ARC. The story, however has NOTHING to do with what Missy is talking about…it’s just the concept of “what if” for the main character that falls into the “flip it and reverse it mold” and the grittiness is exactly the attitude needed in some instances that’s needed by our protagonist to pull through her issues…. What if Fiona never had an accident that scarred her for life? What if the surgery never happened? What if someone heard my music? I will put this in my library for all my girls who love that romantic tear jerker in which life crashes down in the middle of “forever after.” Coming out March 17, 2015. Moriah McStay lives in Memphis, TN with her husband and 3 daughters. This is her first novel. She’s currently working on a second. ← Another Day by David Levithan is Coming to a Shelf Near You Late Summer!